Performance and Inequality. PhD thesis, Maastricht University. Introduction, Chapter 2, Chapter 3 Chapter 4, Chapter 5, Chapter 6, and Conclusion. Schwabe, F., R. Korthals, and T. Schils (2019) Positive Social Relationships with Peers and Teachers as Moderators of the Big-Fish-Little-Pond Effect. Learning and Individual Differences, 70, p. 21-29. Dronkers, J. and R. Korthals (2016) Tracking in the Netherlands – Ability selection or social reproduction? In Blossfeld, H.-P., Buchholz, S., Skopek, J., and Triventi, M. (Eds. ), Models of Secondary Education and Social Inequality – An International Comparison (pp. 149–165). Cheltenham, UK and Northampton, MA, USA: Edward Elgar Publishing. Korthals, R. (2015) The Pre-Tracking Effects of Parental Background. ROA Research Memorandum, no. 2015/05, Maastricht University. Dronkers, J. and R. Korthals (2016) Tracking, Schools’ Entrance Requirements and the Educational Performance of Migrant students. In A. Hadjar and C. Gross (eds.) Education Systems and Educational Inequalities. Bristol, UK: Policy Press. Dronkers, J. and R. Korthals (2015) Tracking, schools’ entrance requirements and the educational performance of migrant students. ImPRovE Working Paper, no. 15/08. Antwerp: Herman DeleeckCentre for Social Policy – University of Antwerp. Korthals, R. and J. Dronkers (2016) Tracking and Selection on Performance. Applied Economics, 48(30), pp. 2836-2851. 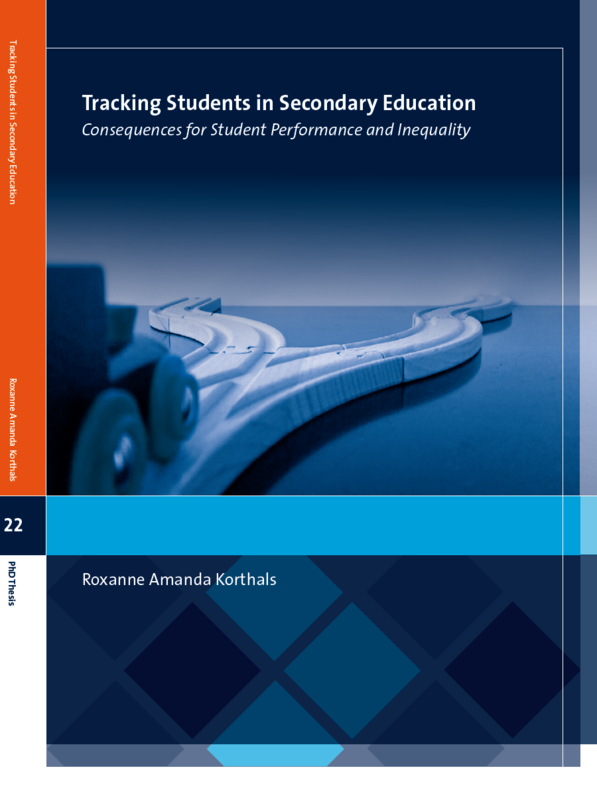 Korthals, R. (2012) Selection and Tracking in Secondary Education: a Cross Country Analysis of Student Performance and Educational Opportunities. ROA Research Memorandum, no. 2012/14, Maastricht University. Werfhorst, H. van der, L. Elffers, and S. Karsten (eds, 2015) Onderwijsstelsels Vergeleken: Leren, Werken en Burgerschap. In cooperation with T. Bol, V. Di Stasio, J. Dronkers, R. Korthals, M. Levels, R. van der Velden, D. Webbink and J. Witschge. Policy report, edition of Didactief Onderzoek. Meng, C., A. Verhagen, R. Korthals, and T. Huigen (2014). Evaluatie van het School Ex 2.0 Programma. De rol van Studiekeuze- en Exitgesprekken in het MBO. ROA Report, ROA-R-2014/2. Maastricht: Research Centre for Education and the Labor Market. Friends and field of study choice in the Netherlands. Together with Zsófia Boda. The effect of exposure to STEM in secondary school on field of study choice. The Effect of Track Placement on Cognitive and Non-Cognitive Skills. Together with Lex Borghans and Trudie Schils. Does Early Educational Tracking Increase Inequality? Short and Long Run International Evidence. Together with Olivier Marie and Dinand Webbink. The effect of birth control legislation on women’s fertility decisions: Evidence from legal reforms in Europe between 1960 and 1999. Together with Mark Levels, Ariana Need, Nan-Dirk de Graaf, and Ben Pelzer. The effects of accelerating the school curriculum on student outcomes. Korthals, R. (2017) The Effects of Accelerating the School Curriculum on Student Outcomes. ROA Research Memorandum, no. 2017/01, Maastricht University. Multi-attribute Compositional Voting Advice Applications (MacVAAs): a Methodology for Educating and Assisting Voters and Eliciting Their Preferences. Together with Mark Levels. Korthals, R. and M. Levels (2016) Multi-attribute Compositional Voting Advice Applications (MacVAAs): a Methodology for Educating and Assisting Voters and Eliciting Their Preferences. ROA Research Memorandum, no. 2016/04, Maastricht University. Birth order and family structure. The Education Revolution on Horseback I: The Relation between Napoleon Bonaparte and Education System Characteristics. Korthals, R. (2016) The Education Revolution on Horseback I: The Relation between Napoleon Bonaparte and Education System Characteristics. ROA Research Memorandum, no. 2016/05, Maastricht University. The Education Revolution on Horseback II: Using the Napoleonic Wars to Elicit the Effect of Tracking on Student Performance. Korthals, R. (2016) The Education Revolution on Horseback II: Using the Napoleonic Wars to Elicit the Effect of Tracking on Student Performance. ROA Research Memorandum, no. 2016/06, Maastricht University. The Consequences of Track Mobility for the School to Work Transition. Evidence from the Netherlands. Together with Mark Levels. Korthals, R. (2016) Overwegingen bij het indelen van leerlingen in onderwijsniveaus. Cascade, April 2016. Korthals, R. (2016) Tracking in het voortgezet onderwijs. De Nieuwe Meso, March 2016. L1 Radio (2016) Interview with Roxanne Korthals about the advice of the Council Education in 2032 (Platform Onderwijs2032). L1 radio program De Stemming, February 14th, 2016. Borghans, L., R. Korthals, R. Haenbeukers, A. Schepers, and T. Schils (2016) Limburg wil Duits behouden. Didactief Online, January 2016. Korthals, R. (2015) Ongelijke kansen door afkomst. School Management Totaal, december 2015. BNR Nieuwsradio (2015) Interview with Roxanne Korthals about her PhD thesis. BNR Nieuwsradio, June 18th, 2015. Korthals, R. (2015) “Vroege” leerling dupe van Nederlands selectie systeem. Didactief, May 2015. Levels, M. and R. Korthals (2013) Meet vaker. De Volkskrant, September 9th, 2013. Levels, M. and R. Korthals (2012) Vluchten de kiezers nu naar de flanken? Joop.nl, October 25th, 2012. L1 Radio (2012) Interview with Roxanne Korthals about the Political Scale (de Politieke Weegschaal). L1 Radio, August 25th, 2012. Huygen, M. (2016) Citotoets moet weer grotere rol gaan spelen bij schoolkeus. NRC Handelsblad, April 14th, 2016. Truijens, A. (2015) Ga maar naar de havo of het vmbo, dat is prettiger voor jou. De Volkskrant, June 19th, 2015. Kuiper, R. (2015) Bij advies havo-vwo pakt vwo-keus gunstiger uit. De Volkskrant, June 18th, 2015. De Hoog, M. (2015) Elk jaar gaan duizenden kinderen naar de verkeerde school vanwege hun geboortemaand. De Correspondent, May 7th, 2015. Marreveld, M. (2015) Bij twijfel: Opwaarts! Didactief, April 2015.